Having come across this stunning home on the weekend, I knew it would take a lot of patience to hold off till today to post it, but that was the earliest I could squeeze it in! Featured on Dwell, the Copenhagen loft belongs to two Danish designers and was once part of a pencil factory. That immediately rung a bell, so I did a bit of digging and found a previous tour of the home on Bo Bedre that I remembered from October last year. 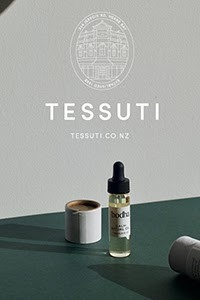 Just as the Dwell feature is now making tracks around the blogosphere, so did that article, but this time around I can't hold off sharing it with you. These fresh new images are so gorgeous, I only wish there were more! 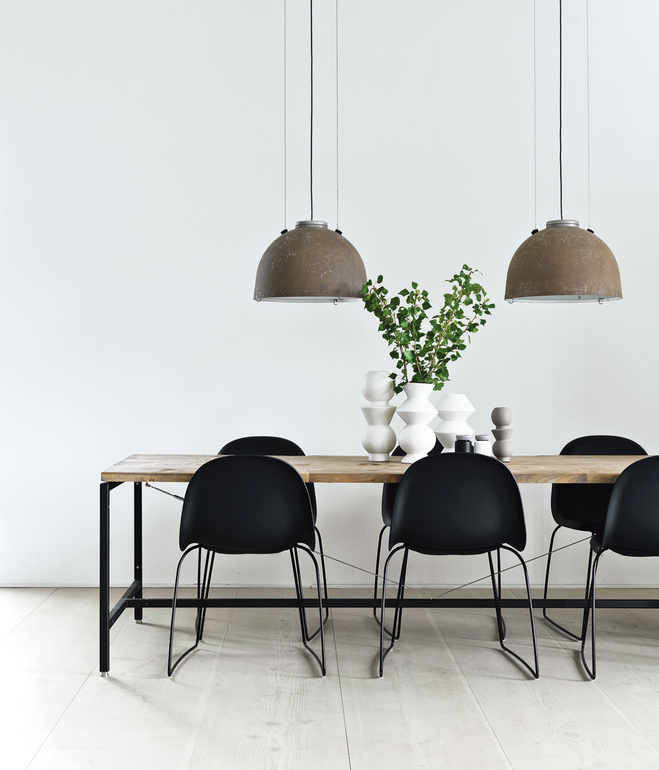 The owners are Morten Bo Jensen, the chief designer at Danish industrial design company Vipp, and his partner Kristina May Olsen, a graphic designer. I've always admired the Vipp kitchens and products that regularly pop up on the Scandinavian blogs I follow, so it was no surprise to me that Morten's home would reflect the same clean design aesthetic Vipp is known for. Judging by Kristina's Pinterest boards which I've recently started following, she too has impeccable taste, and together, they've created an amazingly stylish family home. The beautiful dining table was actually Morten's first piece for Vipp, featuring a powder-coated aluminium frame with a recycled, untreated teak top. Adding to the industrial style are the pendants that were once Copenhagen streetlights. Salvaged and rewired, they add a big dose of wow. 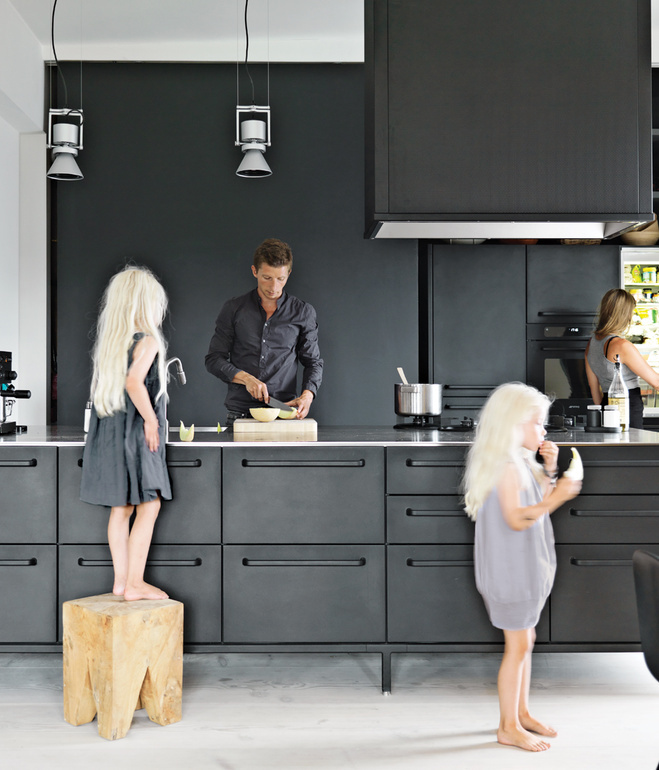 The striking black kitchen, designed by Morten for Vipp, provides a functional space for the couple and their gorgeous twin daughters Merle and Anine. One of my favourite elements of this apartment is the exquisite Dinesen flooring that Morten and Katrina had installed. Finished with a white wash, it melds seamlessly with the walls. 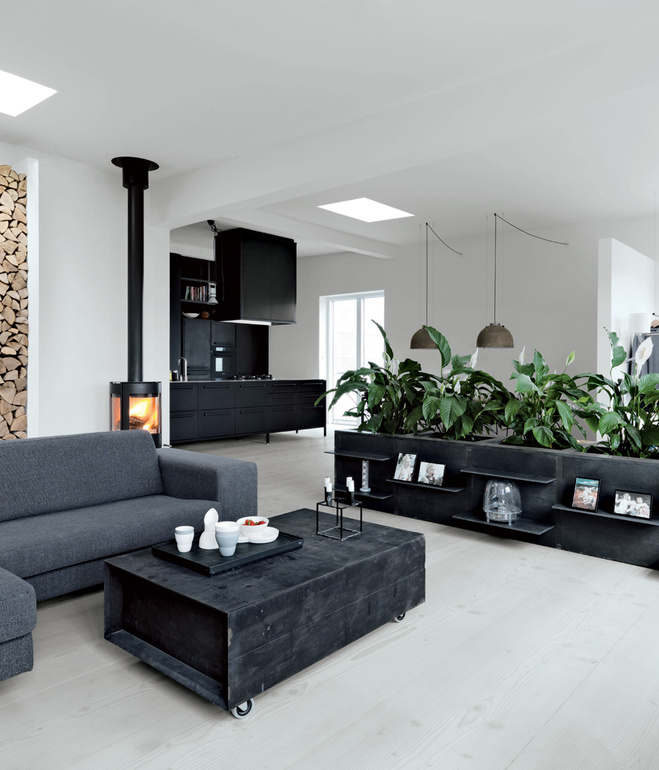 The built-in firewood nook was designed by Morten, and the indoor planters which were Katrina's idea are made from poured concrete and lacquered MDF panels. 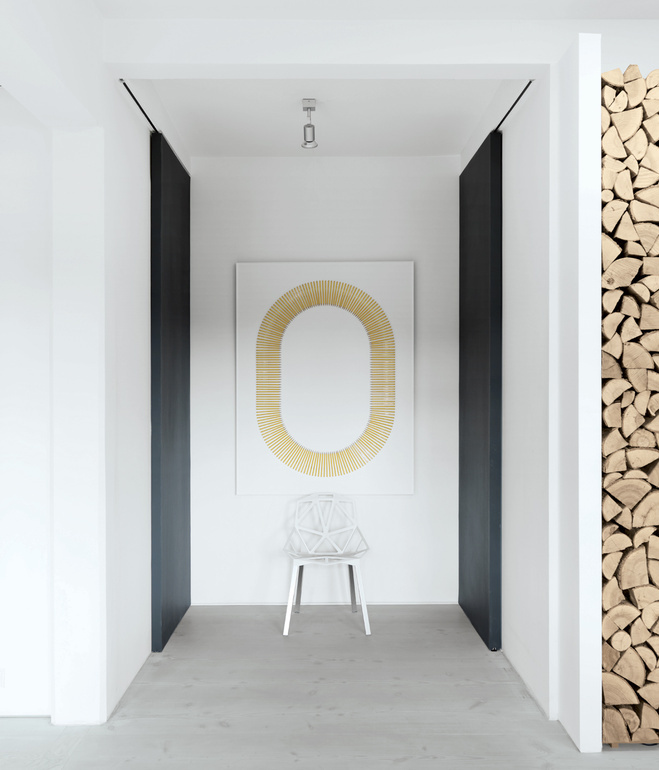 These clever design features help achieve that winning combination of monochrome, wood and touches of greenery. 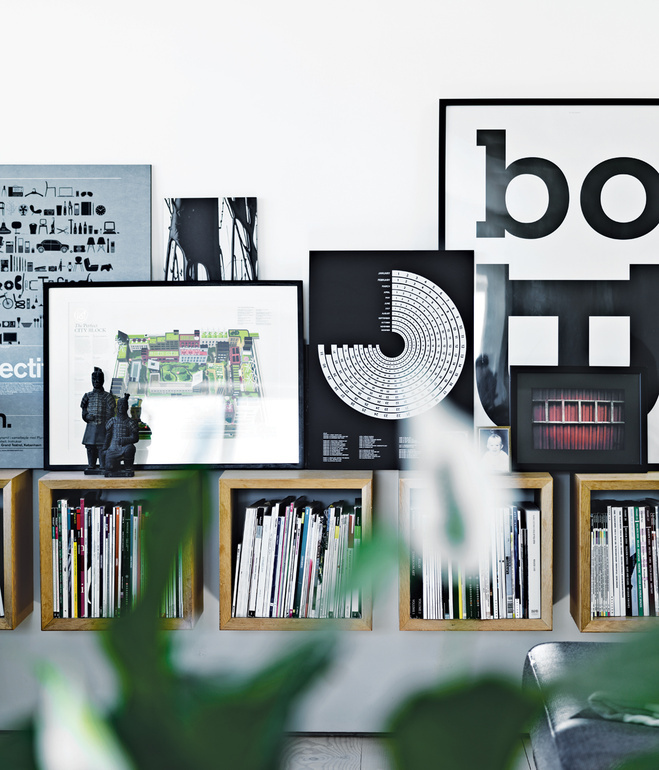 I love the boxed shelving designed by Jesper Holm in the living area. Providing an alternative to the traditional sideboard, they are perfect for storing magazines and books. Katrina's own artworks are displayed on top. Inspired by the apartment's history, Morten created the eye catching artwork above using Viking pencils. The white Konstantin Grcic for Magis Chair is one of my favourite design pieces. 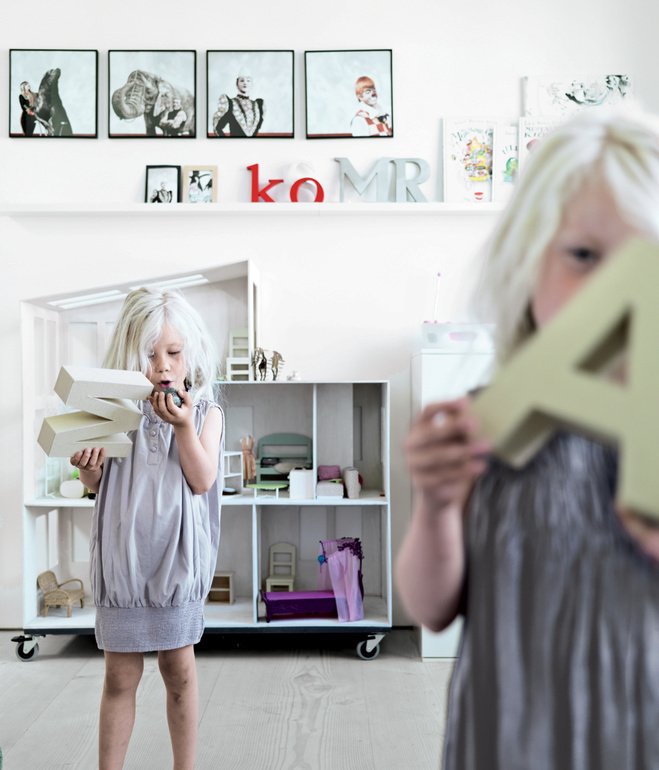 Open shelves for displaying books and letters, a cute gallery wall and impressive dolls house make this a dream room for two little girls. 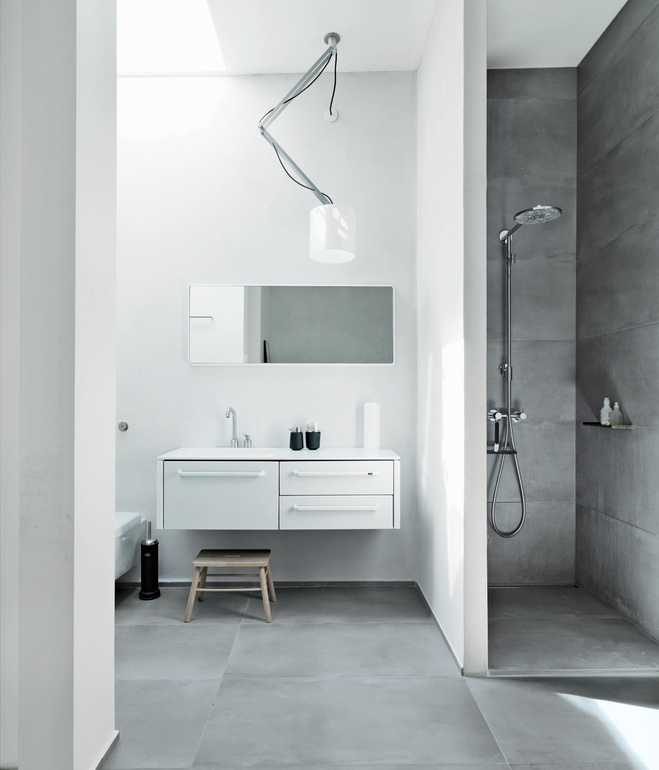 I'm also really inspired by the bathroom which features a Vipp vanity and mirror, Hansgrohe showerhead, beautiful floor tiles, statement light and touches of black and wood. Perfection. Grat blog Michelle. Hug. 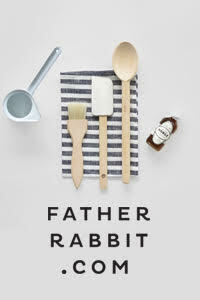 Such a chic house yet family-friendly too. Some great stylish storage ideas. Such an amazing home filled with clever ideas for many of us to "borrow," but I can't take my eyes off of that black factory cart used as a coffee table. Nice post.. Ingenious and inspirational ideas which gives a stylish look to house. I love your kitchen so much and that books rack. I love by exploring your blog. Living room as its best!